Opening hours: Shops are open Monday to Saturday between 9.30 am to 1.30 pm and from 4.30 pm to 8 pm. Shops are generally closed on Sundays. Some department stores have moved away from the traditional siesta and are open all day. In order to explore the laid-back Galician lifestyle you need to take a stroll down the new and very attractive promenade. This will give you plenty of opportunities for sightseeing and also a chance to enjoy the fantastic atmosphere of the city. 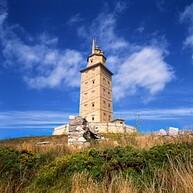 Torre de Hercules might be the world’s oldest light house. It was built by the Romans in the 2nd century and is well worth a visit. 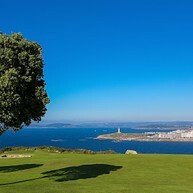 Here you can learn more about the city's history and enjoy an excellent view over A Coruña. 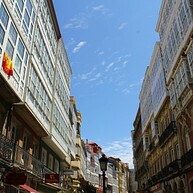 Ciudad Vieja (or Old Town) is a compact zone constituting most of the old A Coruña which dates back to the mid-19th century. In this area you can find the city’s flamboyant and unmistakable landmark, ayuntamiento. 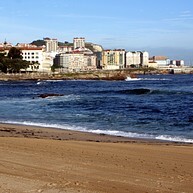 La Coruna’s coastline offers a stunning 30 kilometre stretch of sandy beaches. Playa de Riazor and Playa de Orzan are two protected beaches conveniently close to the city. In the summer, buses regularly go from the town centre to the fabulously sandy Playa de Baldaio. 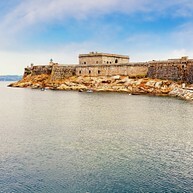 This 12th century fortress is keeping watch over the port and the Old Town of A Coruña. Today it houses a Museo Arqueoloxico e Historico (The Historical and Archaeological Museum) with some rather incongruous ancient Egyptian pieces through Roman and Visigoth artefacts to more recent times. A Coruña has been dubbed the ‘city of glass’ and if you head down to the waterfront you will find out why. Multi story houses sport a rather unusual and almost uniform protective layer of “gallerias” or glassed-in balconies. 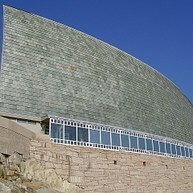 This innovative building features a brilliant art gallery with works by Rubens and etchings by Goya. There is also an impressive collection of 16th and 17th century European paintings. In a small town like A Coruña, this majestic square is hard to miss. Located at the heart of the old town, this square is where one would go to see the local ayuntamiento, the statue of María Pita or simply relax in one of the many cafes. If you're looking for a nice hiking spot not too far from the city - look no further, for Monte de San Pedro is a beautiful outdoor location for a hike and/or picnic while taking in the beautiful views over the city and the ocean. This museum mainly focuses on explaining how the human body functions, and even though the texts are primarily in Spanish, there are quite a few interactive exhibits that are easily accessible even to non-Spanish speakers, including kids. 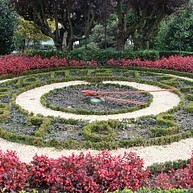 This beautiful garden in the city's central area is a wonderful place to go on a hot summer day. Oder a beer at the bar inside and enjoy the outdoor seating.